Carolina Fuentes had seen enough death in her native El Salvador to know it was no longer safe to stay. Above: Carolina Fuentes at her film screening. Photo courtesy of Carolina Fuentes.Four classmates at the Jesuit university where she studied in the 1980s had been murdered by the military. Her friend and fellow musician Ricardo Merlos had been assassinated, and composer Guillermo Cuellar had been arrested and tortured for music the government considered subversive. As a singer of protest music, called Nueva Trova (New Song), which Merlos and Cuellar had also practiced, Fuentes knew she also was in danger and fled north. She landed, first, in Mexico, where she lived for seven years. Then she moved to California’s Central Valley, where she worked as a journalist at Radio Bilingue, the Spanish PBS, and then for 16 years as a reporter for Univision in Fresno and Los Angeles. 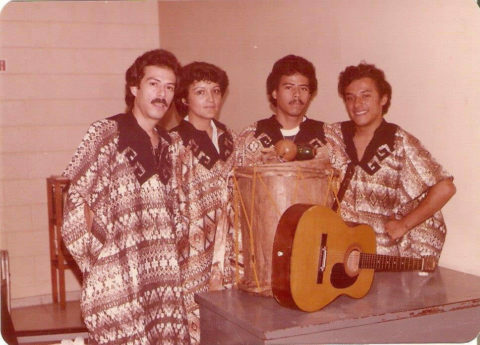 Carolina Fuentes with fellow musicians in 1980. Ricardo Merlos is behind the big drum. Carolina Fuentes had seen enough death in her native El Salvador to know it was no longer safe to stay. Photo courtesy of Carolina Fuentes. In 2006, her life turned again. 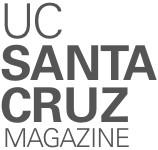 When her television contract wasn’t renewed, she headed for UC Santa Cruz. It was there that she mentioned a life she’d rarely spoken about. A classmate encouraged her to tell that story in film. “It was the realization that I had been denying my true self for so many years,” she says of her decision to document what had happened to the protest singers of El Salvador and to her generation. With an initial $4,500 budget from her Berkeley Human Rights Institute fellowship and three years of emotionally draining work, Fuentes finished the film, Our Right to Sing, which was eventually screened at the National Theatre for the arts in her home country. “Music becomes the collective voice of people, for expressing ideals, hope, frustration, and anger in the context of social repression,” says Fuentes from El Salvador, where she is now teaching. Read a companion Q&A about Fuentes’s experiences.